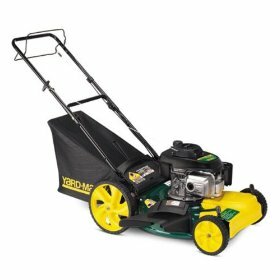 Yard-Man offers many different types of lawn mowers for you to choose from. You might consider the different types based on the size of the area of grass you need to mow and what you prefer. You can choose from different types of riding lawn mowers and push mowers. There are many differences. Yard-Man is a reputable company and there are many reasons why people choose products made by them. There are many reasons you might consider a push mower. The primary reason is because of the cost. They are far more affordable than a riding lawn mower. You might only pay a few hundred dollars for a good push mower in comparison to a couple thousand with a riding lawn mower. In addition, you might not have that much grass to mow and it may not be logical to have a riding mower. 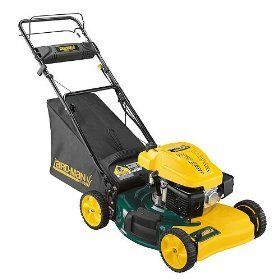 There are many push mowers you can choose from made by Yard-Man. The three most common push mowers include a traditional push mower, a self-propelled push mower, and a self-propelled push mower with a bag on the back. There are many differences of these mowers you might consider. The traditional push mower comes with an optional bag on the back. If you don’t mind raking the excess trimmings up when you are done or you want a cheaper mower you might consider the mower without the bag. 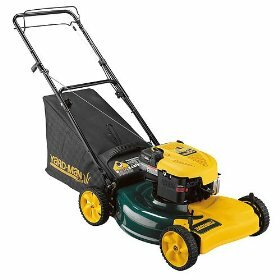 The traditional mower comes with a 160cc OHC Honda engine and an ARCS starting system. The cutting width is 21 inches. You have to push this mower and it is considered to be good exercise. This mower has 8” front wheels with 12” rear wheels. It also comes with a 2 year limited warranty. The self propelled push mower is nice because it actually moves with you so you aren’t pushing as hard or working your back so much. This mower requires you to do half of the work. The engine on this is the 139cc MTD OHV. There is not a prime starting system which means you must pull a pull string. 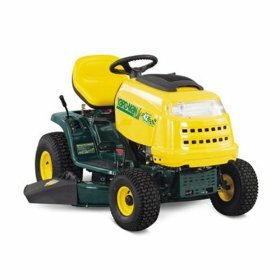 This mower is front wheel drive and it also has a two year warranty. The self propelled rear bag push mower can hold 2.3 bushel and has a Briggs & Stratton engine that is 190cc. The starting system is a recoil. You can use this mower in three different ways. You can mow, mulch, discharge the grass or gather the grass in the rear bag. The cutting width is 21” and it has variable speeds. This mower also comes with a two year warranty. If you are considering a riding lawn mower it may be the best solution if you spend long hours mowing large areas of grass. This can help you save time and be easier on your back. There are three primary riding lawn mowers you might consider from Lawn-Man. There aren’t many differences with the riding lawn mowers. The first riding mower is the model 13A0772G055 that comes with a Briggs & Stratton engine. It is a single cylinder and does not have an oil filter. The transmission has 7 different speeds and is manual. You step through the frame of this mower and it is easy to get on as it is to ride. The seat is a low back and comfortable. The next riding mower you can choose from the Lawn-Man includes the 13A0771H055. This mower has the Briggs & Stratton 19.5 engine. It is a single cylinder and does not have an oil filter. The transmission on this mower is also a 7 speed manual. The seat has a mid-back so you can sit a little more comfortable and adds a little more support. The front axle is steel also. The third riding lawn mower offered from the Yard-Man is the 13AX615G055 model. This mower has a Kohler Courage 19.0 engine and is considered top of the line. This is a single cylinder and it does have an oil filter. The transmission is a Hydrostatic with a foot control. It is also a manual transmission. This frame is a step through deluxe with a mid back seat. The frame is steel on this mower also. All of the Yard-Man mowers come with a two year warranty. This is an excellent benefit because you don’t have to worry about problems occurring with the mower. Should a problem occur it will be covered under the warranty and repaired or replaced. A warranty is a very important thing and you should never buy a mower without one. Yard-Man also offers other things for your landscaping needs. You can purchase things like chore performers and trimmers. These are also known as weed eaters. These are very helpful for the final touches of a perfect lawn. They help you get the tall strands of grass up against the house that the mower cannot get and around rocks and trees. Yard-Man thrives on building strong and durable products that the consumer can rely on. They have been around for over 40 years providing riding mowers and push mowers to the customers. The corporate office is known as Bolens and they provide other outdoor equipment also from name brands like Troy-Bilt, White Outdoor, Yard Machines, and more. It is a name you can rely on and they have the clout to prove it. You know you are getting a quality product when you buy a Yard-Man. There are many different types of mowers for you to choose from if you are looking to start taking care of a front or back yard. You should consider the size of the yard. If you have a lot of grass to mow you might be best with a riding mower. If you are on a limited budget the self-propelled is a good buy and forces you to do less work. The traditional push mowers usually are the most cost effective solution to mowing grass but they require you to do more work to get the grass mowed. You can choose from many types of mowers and every product that comes from Yard-Man is top quality with a two year warranty.